Being as we just got this in Parallel Rare form recently, it's not a bad time to review it. Cyber Jar works against what almost all Advanced format decks are trying to do. It ADDS cards both players' arsenals as opposed to taking away. Field-aggressive decks will love it; hand-aggressive decks not so much. But then again, hand-aggressive decks just took a major hit with the Dark World stuff. Honestly, we'll see how playable this is come the next Shonen Jump Championship. Coin Flip Cyber Jar… This is one of my old and personal favorites. I won't play it in four out of every five decks I make, and the one of those five is usually a jank deck that I could probably fit three copies of Sparks into, should I feel the need. Hmm. Every Jar to this date, excepting Dimension Jar, has had a gamebreaking effect. At one point in the first Japanese banlist era, Cyber Jar was banned right alongside Fiber Jar. When they brought Fiber Jar back for the second Japanese banlist and the first English banlist, a lot of us saw the chaos that ensued from THAT. I don't want to lose 7 cards of card advantage just to give you a free reset button. I really don't. But hey, you're running a damn 500/500 Plant that's one of two cards in the game where a tree is the focus of the picture. I don't know what to say. So I guess the most peculiar question is what happens to Cyber Jar? Well, Cyber Jar is awesome in a number of decks, only few of which its played in. Blowback Dragon, while an awesome card, is luck based. People don't like entering luck into an equation when they think their skill can finish it. Cyber Jar is luck based. The same awesome hand it gives you could be given to your opponent the next match. It's inconsistent. But in that regard, we can't forget that it's also a Dark Hole. Dark Hole is a powerful card. Dark Hole plus 5 cards for both players does not an unrestricted card make. Cyber Jar is fun. Should you be playing it? Probably not. There's some fun stuff you can do with Kaiser Colosseum, yes, and there's some super fun stuff you can do with Card Destruction thereafter (Thank you, Navarro, for your Empty Cookie Jar deck…), but for the most part it will give you five cards and a random amount of special summons in those five cards. You do NOT want to hit Breaker, D. D. Assailant and D. D. Warrior Lady and run into A) a Dark Hole, B) a D. D. Survivor, or C) a Torrential Tribute. Will that always happen? No. Could it? Yeah, and that's a quick -3 advantage immediately to your opponent's one card. Is it worth it? Not really. Could it be great for your deck? Yes. Bob Doily Cyber Jar, yah! One of my old favourites. 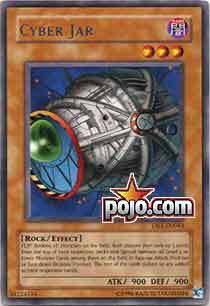 So essentially Cyber Jar is speed, that is what he truly is, he blows stuff up, and gives everyone more cards. Now this is where the problem arises. In this format topdecking happens a lot, Cyber Jar can prevent this by giving both players more options. Cyber Jar has the potential to let the opponent field a large amount of this. Especially since most high tier decks are running a large amount of monsters. That combined with higher total attack being fielded than ever before means that you are setting up the opponent to kill you, or you them. You are much better off focusing your deck on establishing advantage or on using cards that in the worst situations replace themselves so that you don’t lose advantage. Dark Paladin Cyber Jar is our card for today, and it is really one that about every deck should run. The effect is incredibly simple. Flip, and all monsters on the field are destroyed. Then, both players draw 5 cards and special summon any level 4 or lower monsters to their respective fields. Don't mean to be short, but it's good, and you don't need me to tell you.